As a nature photographer. This is our reccomendationwhere must go in Island of Oahu. Skip the dole plantation, Macadamia nuts farm or coffee farm where we call tourist trap. 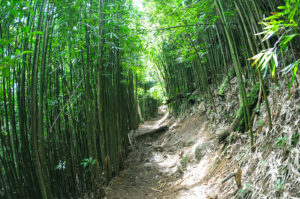 Number 2– Manoa valley. This is tourist place but I love here. LEGEND OF KAHALAOPUNA: The legend of Kahalaopuna, princess of Manoa. 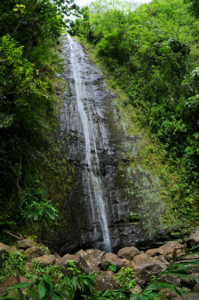 A legend which also explains the beauty of Manoa valley on Oahu, blessed by rainbows, rains, and reassuring winds. Daughter of Manoa Wind, and Manoa Rain, Kahalaopuna grew up as the most beautiful girl in Hawaii at the time. She was given as bride, in infancy, to chief Kauhi of Kailua. with jealousy, and he killed her with a cone of hala nuts, then buried her body hastily. An owl unearthed the girl with his claws, rubbed his head against her bruised temple, and restored her to life. She followed Kauhi, trying to reconcile. He killed her three more times! The owl brought her back to life each time. 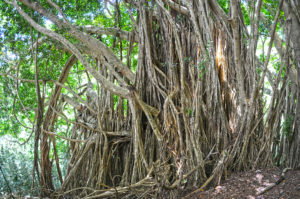 The fifth time Kauhi buried her far away and deep under the roots of a large koa tree. Now the owl worked so hard yet was unable to scratch the earth away and finally had no other choice but to abandon the girl. However, there had been a witness to this last murder and failed rescue attempt! A little bird named elepaio flew to Kahalaopuna’s parents and informed them. They prepared to visit the koa tree and find her remains. Meanwhile, the girl’s apparition appeared for chief Mahana, who, as directed by his vision, also went to the koa tree and found her body still warm. With the help of his spirit sisters he brought her back to life and gradually she healed from the ordeal. Mahana loved her and cared for her. Kauhi, this time, didn’t know that she had returned to life. Yet when Mahana asked for her hand, Kahalaopuna still felt under the obligation to marry Kauhi! In secret, with his brother and her parents, Mahana planned to kill the murderous fiancé . The two rivals met in a trial, and Mahana, who knew the truth, won. Kauhi, as well as the two chiefs who had spread the disastrous rumors, were baked in ground ovens and Mahana received Kahalaopuna as his wife. They were happy for two years, till Kauhi, in the form of a shark, devoured her. This time for ever. Such are the stories of the Hawaiian owl, a bird of power. When you hear the scream of silence, the rustle of soundless wings, an effortless shadow gliding by, look up in the high blue skies, follow the owl’s smooth dive. Pueo’s presence might be there for you. 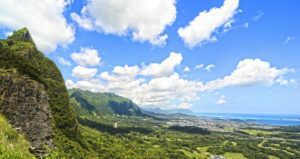 Number 3– Nuuanu Pali lookout, great view and deep history. The Nuʻuanu Pali was the site of the Battle of Nuʻuanu, one of the bloodiest battles in Hawaiian history, in which Kamehameha I conquered the island of Oʻahu, bringing it under his rule. In 1795 Kamehameha I sailed from his home island of Hawaiʻi with an army of 10,000 warriors, including a handful of non-Hawaiian foreigners. After conquering the islands of Maui and Molokaʻi, he moved on to Oʻahu. The pivotal battle for the island occurred in Nuʻuanu Valley, where the defenders of Oʻahu, led by Kalanikūpule, were driven back up into the valley where they were trapped above the cliff. Kamehamehaʻs warriors forced Maui Chief Kalanikupule’s men to their deaths off of the cliff. Roughly 400 warriors died in this battle. After this battle, Kapanui recited a Hawaiian chant as a sign of respect to those who have died there. In 1845 the first road was built over the Nuʻuanu Pali, to connect Windward Oʻahu with Honolulu. In 1898, as this road was developed into a highway, workers found 800 human skulls—believed to be the remains of the warriors who fell to their deaths from the cliff above. This road was later replaced by the Pali Highway and the Nuʻuanu Pali Tunnels in 1959, which is the route used today. The now extinct bird, the Oʻahu nukupuʻu, was last collected in this valley. There is also a legend that takes place around the Nuʻuanu Pali. This is The Ghost Dog Legend. This legend states that when people came across this dog on the Pali, they had to turn back around or else they would not make it up the steep mountain. Because of these events, it is said that coming across this dog would lead to kaupe, meaning disaster. by Wikipedia. 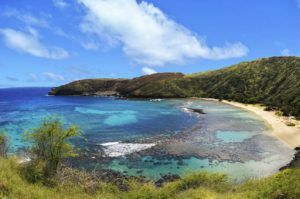 Number 4– Hanauma bay lookout. 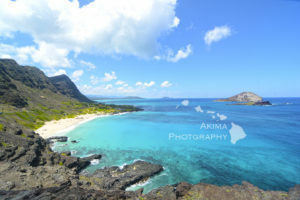 This is one of the most popular tourist destinations for snorkeling but view from lookout is outstanding. A beautiful reef and you may see sea turtle. This is a home for 400 sea life. A marine embayment formed within a tuff ring. The Hanauma Crater was created about 32,000 years ago during the Honolulu volcanic series, the latest (and perhaps final) round of volcanic activity to occur on Oʻahu. The word hana means bay in the Hawaiian language (the usual addition of bay in its name is thus redundant). There are two etymological interpretations of the second part of its name. One interpretation derives it from the Hawaiian word for curve, referring to either the shape of the feature or to the shape of the indigenous canoes that were launched there. Another stems from the indigenous hand-wrestling game known as “Uma”. Number 5– Honolulu lookout. This is not really “nature” but one of the my favorite place to go in Honolulu. A populer place for night view but you should come day day. You may see diamond head on the left and Honolulu air port on the left. 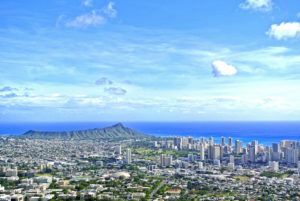 Blue Ocean, wite wave and waikiki skyline. If you want to go these five place in a day, why don’t you book our private tour. Contact us for the detail.